My shapewear malfunction begins with the perfect dress. My favorite dress is the perfect dress. The perfect dress, for me. It’s timeless with great adaptability. I can wear it dressed up or down, with open toe shoes or boots, casual or dressed up or office. This favorite dress now shows my bitty belly bulge more than I like. We all have assets and deficits, but when we go through a new life transition that results in body changes, it takes some time to adjust. Adjust our attitude and belief about it, or adjust our wardrobe to accommodate it. This was a case of my body simply does not look the same in a dress I bought over a decade ago, even if the dress is still in style. But I still want to wear it! 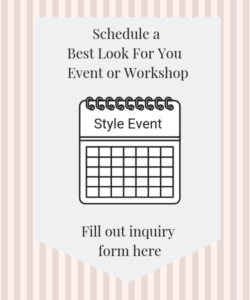 I am a style coach. I tell my clients often that we create dissatisfaction for ourselves when we insist on looking like we did two babies, sizes, or decades ago. Note to self: listen to your own advice. Shapewear to the rescue. 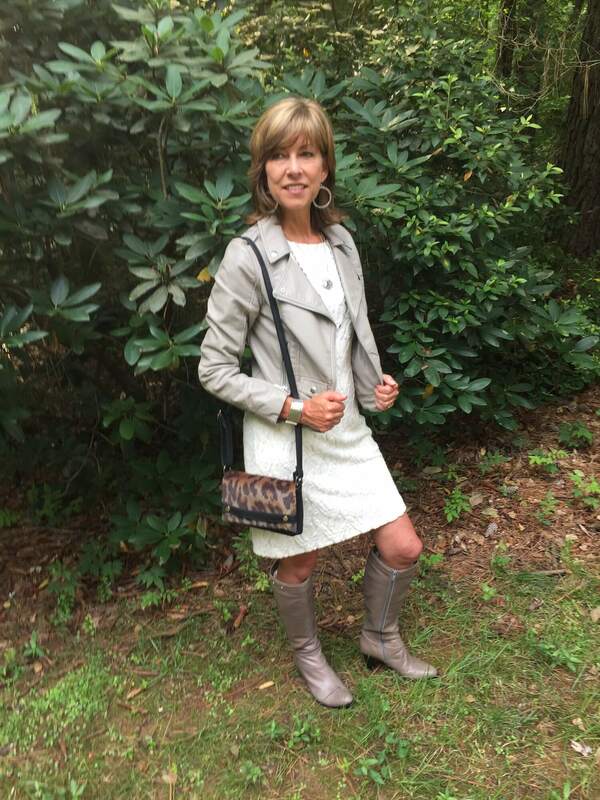 I posted a fashion tip about the virtues of ruching detail. 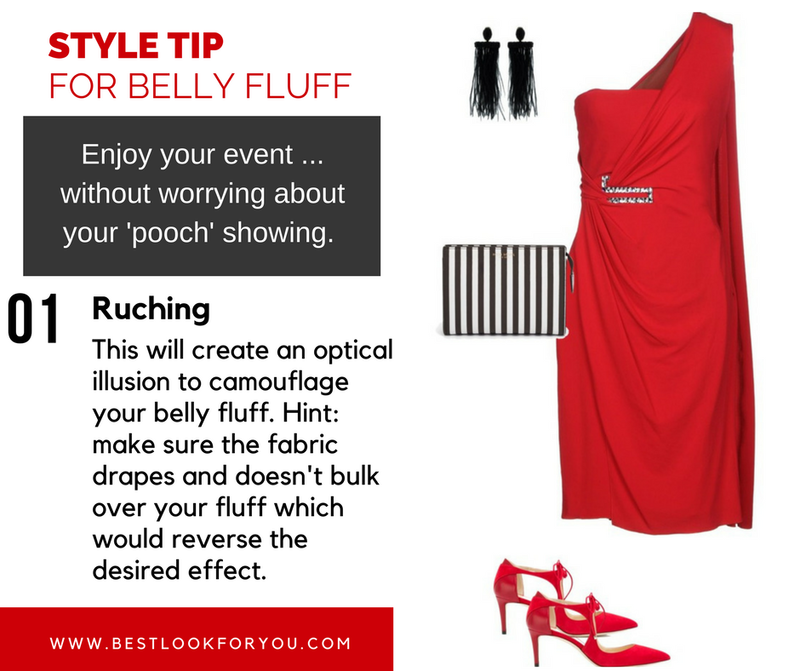 Ruching can hide a multitude of pounds without shapewear in some cases. I’m all for shapewear when you need it. But if a design detail like ruching can take care of a little roll here and there without the minor discomfort of shapewear – why not? In that post I referenced one of my most embarrassing moments … related to shapewear. It was an anniversary date with my husband. I got as dressed up as I get these days (apart from my daughter’s upcoming wedding). I don’t get dressed up as often as I did a few decades ago. Unbeknownst to me a lot of time, and a few shifts, sags, and new bulges have transpired since the last time I wore my perfect dress. I had been planning all along to wear my favorite dress. The perfect dress. 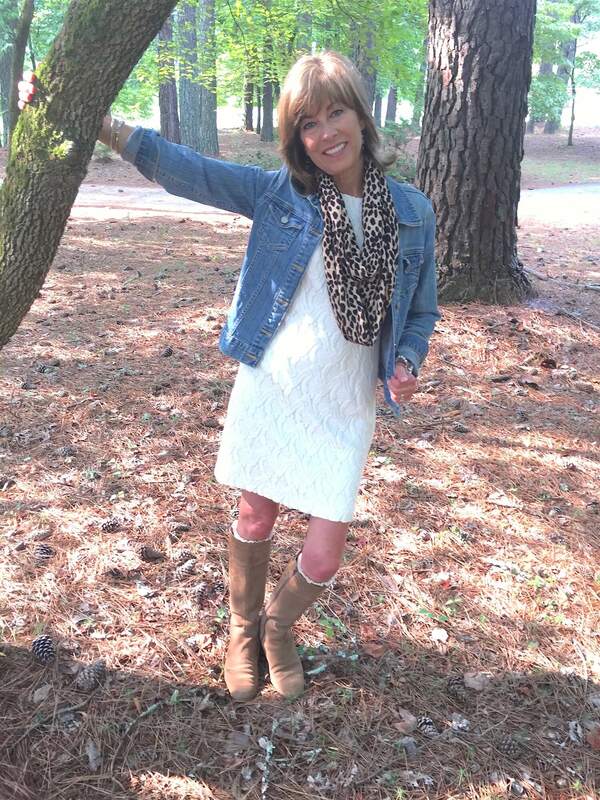 I did not wear it with the boots in these pictures. Sorry but I have no pictures of the outfit from that night. I wore cute animal print flats. Heels almost always give me cramps in my feet and calves. Back to my perfect dress. I had no idea that my bitty belly bulge, small as it was, protruded beyond my bustline. How? What? When did that happen I wondered as I turned for a sideways check before we left. Ladies: always check your outfit from the front, side and back before you leave. People see you coming and going. After menopause I started putting on a little more fluff in the middle. It’s noticeable if I wear fitted outfits because I have a petite bustline and a very small rib cage. It’s reality math. Unless you have a small bust, you don’t realize just how much balance a bust brings to your shape. Pause for praise for bust balance. I’m not complaining just explaining. This bitty bust and bitty belly bulge is what possessed me to buy a waist cincher for my middle. On rare occasions, like this anniversary date night, when I wear a fitted outfit with this waist cincher, I can enjoy my event and outfit without a thought about my belly. True until … this most embarrassing moment of my shapewear malfunction. I enjoyed walking with confidence into the restaurant on my husband’s arm. We enjoyed an appetizer which we usually forego when we go out to eat. It was a special occasion so we splurged at every level. I believe it was about this time after the appetizers that I began to feel a little uncomfortable in my shapewear. I hadn’t realized that the waist cincher had boning in it. 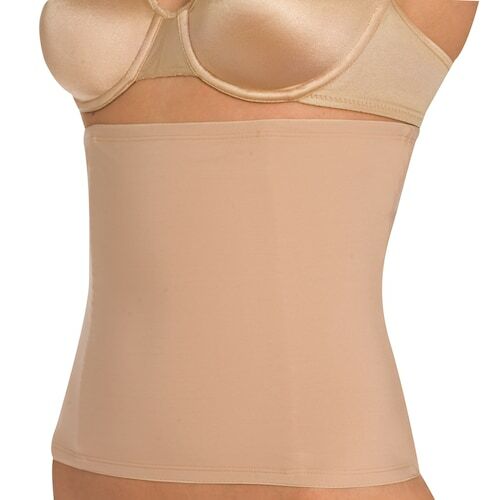 Boning is a stiff plastic or metal piece running the entire height of the shapewear. There were two in the front and two in the back of my cincher. It would not have been a problem at all except that I am a petite and I am short waisted. That presented a unique problem most women wouldn’t have. The boning was longer than my section it was cinching, so it was actually piercing into my top rib bone just under my breast. It was distracting from all the sensory pleasures of the palate I was attempting to enjoy in this meal. I excused myself from the table to the ladies room. I had a plan to fix this problem. In the ladies room I quickly pulled out my Swiss Army knife. What? You don’t carry a pocket knife with you? Well you would have been in a pickle if you had been in my shoes without a pocket knife. Maybe you should get one. I carefully cut a tiny slit at the top of each boning. This boning was metal. No wonder it was hurting. It was easy to slip the boning right out and I just put it in my purse and slipped right back into my seat at the table. Now I was much more comfortable eating my meal. Shapewear challenge resolved. After our salads, main course and dessert we were completely satisfied and ready to go. I gathered my things and stood up to leave. That’s when I noticed a bulky bunch that looked like an inflated flotation device under my dress right at my middle. Shapewear malfunction! I quickly plopped back into my chair absent of any grace or dignity, in sheer panic. Remember this is a fitted stretchy dress. It was not unnoticeable. And since we always go for the early bird to avoid the crowds, the restaurant was empty enough for people to notice me as I walked out. But not empty enough for my satisfaction at that moment. I wondered why they bothered with boning in a waist cincher as I was cutting it out with my pocket knife. The thing was tight enough to stay in place, I thought to myself. Why did the company waste money putting boning in the product? How stupid? Unnecessary discomfort. By the time I had cut the last boning out, I had mentally written a product review suggesting a better design without the boning. Well NOW I can tell you why they put boning in waist cinchers. They are to keep the elastic from rolling up into a tire shaped bunch around your waist! I called upon an escape plan from my most embarrassing moment of my entire life, over 30 years ago. I’ve not healed enough over that mortifying experience to tell it publicly yet. I took my jacket (thank GOD I had brought a jacket) and draped it over my arm to conceal the front view of my tire tube and had Don put his arm around the back of my middle to conceal the back view. Vanity of vanities. Probably nobody was looking but I felt like everyone was staring. There is NO moral of the story. No redeeming lessons to be learned. It’s just an embarrassing moment from a shapewear malfunction. Wait, maybe the malfunction isn’t in the shapewear? Maybe it was in my thinking there was no purpose in the design of the shapewear, when in reality there totally was. When I tried to remove a distinctly functional element of the shapewear, I changed the design and therefore it’s ability to perform it’s function. The result was a malfunction. Maybe there is a redeeming lesson in this story? It’s entirely possible that whatever came to your mind when you read the previous paragraph is the point you were intended to get. Regardless of what you got, I hope you laughed, even if just for a moment. Laughter is healing to the bones. Are Your Prints Making You Appear Larger? 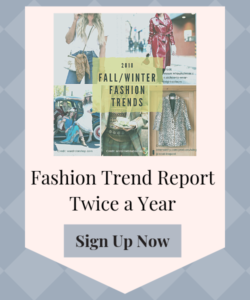 ... and get future Seasonal Trend Reports delivered to your inbox.